Aluminium foil in jumbo roll is suitable for further rewinding into kitchen foil of several meters packed in colour box. It helps to preserve daily food by protect it from light, odour, moisture, and bacteria during cooking and storage. This material is suitable in many circumstances such as roasting, freezing, baking, catering, and miscellaneous kitchen use. Besides, it has excellent performance in microwave oven. Application Roasting, freezing, baking, catering, miscellaneous kitchen use. Aluminum foil has good plasticity and can be used to package various shapes of products. Any shape of container can also be arbitrarily created. Aluminum foil has good thermal conductivity, so it is widely used in barbecues, ovens, etc. 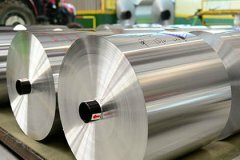 Aluminum foil is a light-proof packaging material, so it is a good packaging material for products that are exposed to sunlight. It is also a non-toxic packaging material that can be in direct contact with food without harming human health. Wooden cargo containers guard the industry and rolled out of the customs, which is solid and strong. The surface of the foil is extremely clean and hygienic, and no bacteria or microbes can grow on its surface. Haomei have much experience in the aluminum foil roll. We have exported to Italy, Greece, Russia, the Middle East, etc. With advanced equipment, superior quality administers and topping working team, we can offer our customers high quality products and the finest services. We are looking forward to establishing long-term business relations with clients.